If a potential spine or head injury is discovered during the head-to-toe assessment, special care must be given to maintain the head, neck, and spine in straight alignment during any treatments that may be given and in transporting the survivor. During the assessment process when injuries are identified, the rescuer is to document, mentally and later in written format, the injuries that need to be attended to once the assessment is completed. These non-life-threatening injuries include burns, wounds, contusions, sprains, fractures, joint dislocations, hypothermia, dehydration, etc. In this article we will focus on the classification and treatment of wounds. A wound is defined as an injury to living tissue caused by a cut, blow, or other impact, typically one in which the skin is cut or broken. In the treatment of a wound, the primary objectives are to control bleeding, prevent infection, and protect from further injury. In our other article titled, “Caring for Survivors of Natural Disasters or Terrorist Attacks” we discussed the techniques to control bleeding. This article will focus mainly on the types of wounds and in preventing infection to the wound. Incision: a very sharp or surgical like cut made in skin and deeper tissues. Laceration: a jagged or tearing of skin and underlying tissues. This type of wound can be caused by numerous mechanisms such as getting a body part caught in machinery, mishaps with tools, trauma contact with any number of sharp and jagged structures. Avulsion: a partial or complete tearing away of tissue and flesh. Usually the result of traumatic accidents, collisions, certain types of gunshot wounds. Puncture: when a sharp and pointed object is forced into the body. While puncture wounds can occur anywhere, they are more common in places like the foot or hand. These types of wounds pose a greater risk for infection. Bacterium can be deposited deep inside the body part where removal is difficult increasing the risk for tetanus. Secondary to stopping excessive bleeding from a wound is to properly clean it to protect against infection. Irrigate the wound with water. One of the most beneficial strategies in the cleaning of a wound involves subjecting the wound to irritation with water. The water pressure to effectively irrigate a wound should be like that of running tap water in your home. The mechanical action of the water hitting the exposed drives the bacterium from the wound. While being highly effective, it also does not adversely irritate the tissues like scrubbing of a wound can cause. 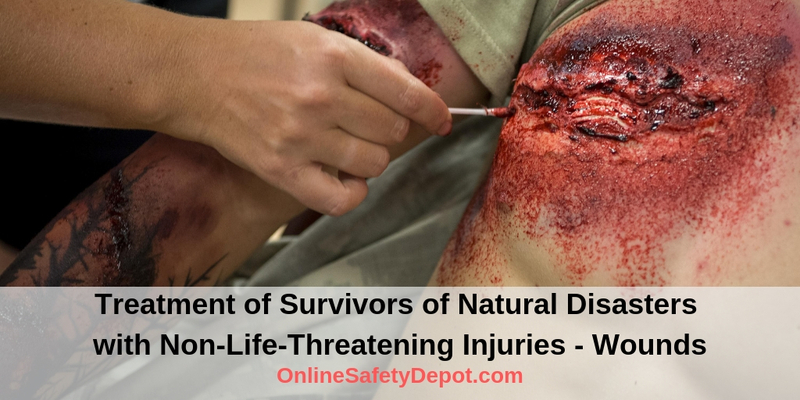 For this reason, a bulb syringe (for smaller wounds) or a turkey baster (for larger wounds) are recommended components of any first aid kit, especially a wilderness first aid kit. Note: If irrigation is unsuccessful in removing small debris fragments from a wound, you would perform a procedure called debridement, a procedure of removing the debris with small tweezers. Flush the wound after irrigation. A mild soap-and-water solution should be applied to the wound after it has been irrigated. Irrigate the wound again. The wound should be thoroughly flushed of all soapy solution and then irrigated again. Dressing. Following cleaning of a wound it should be properly dressed. Sterile dressings should be placed directly over the wound to help control further bleeding and to provide a barrier to infection. If bleeding continues and threatens to soak the dressing, a pressure dressing should be applied to help compress vessels and slow the bleeding without adversely affecting circulation. Bandage. A bandage can come in many forms from an elastic bandage to a cloth bandage, and other forms. A bandage can be used to help apply pressure to the wound if needed and helps keep the dressing in place while serving as a barrier to outside dirt or other potential contaminants. Following the application of a dressing and bandage to an open wound, you should watch for signs that wound indicate the need for further intervention. Continued bleeding. If bleeding continues you may need to apply additional layers of dressing. It is recommended not to remove the previously applied layers of dressing as doing so may break up clotting and restart the bleeding. No Active Bleeding. A dressing that seems to be doing its job should still be removed every 4 to 6 hours to check for signs of infection. At this time, you may choose to flush the wound again. Red skin around the periphery of the wound. If pus or fluid leaks out of the wound. Increasing swelling in the tissues around the wound, especially after several days. A throbbing pain develops at the wound site. A red streak leads from the wound toward the heart. The victim develops a fever. When to Visit a Doctor. A fever of 100.4 degrees or higher and the development of red streaks leading from the wound toward the heart are serious signs of infection and should prompt you to visit your doctor. Like burns, gnarly looking wounds can be very emotional for victims and may require the care giver to be conscious of signs of shock, or merely emotional support.